Members of the French relay squad look on as teams from Denmark and Spain attempt to break the Guinness World Record for fastest par-5 play. How's this for an antidote to slow play? 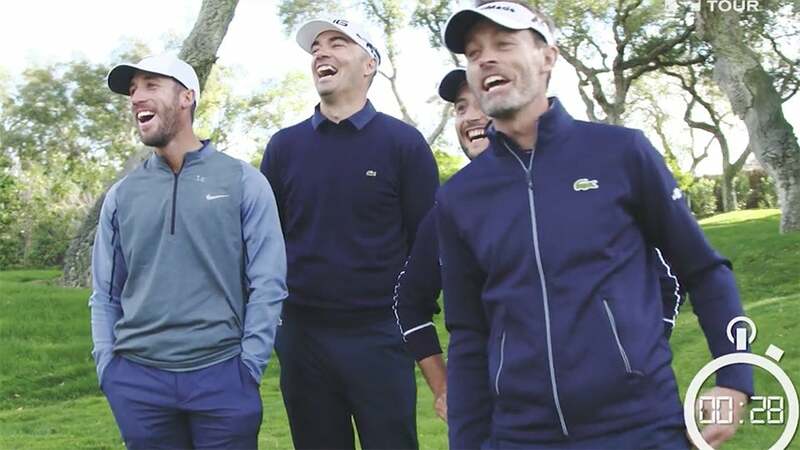 French, Danish and Spanish players from the European Tour participated in an official Guinness World Record attempt to beat the fastest time to complete a par-5. The rules are as follows: a team of four will play a par-5 of at least 500 yards in relay-style, one after the other. The clock starts at tee off and ends when the putt is sunk. And beat the record they did. The previous record stood at 68 seconds...the French squad of Romain Wattel, Alexander Levy, Grégory Havret and Raphaël Jacquelin shattered the record, posting a completed par-5 in just 34 seconds. The French bested Thorbjørn Olesen's Danes (49 seconds) and Sergio Garcia's Spaniards (78 seconds). Talk about a whole new take on ready golf!